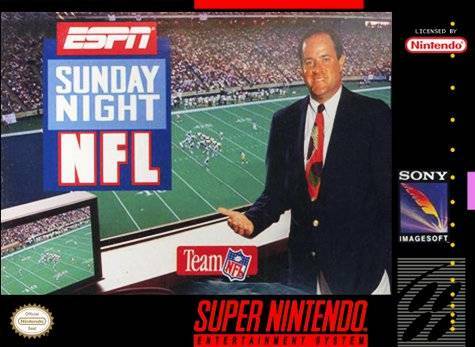 ESPN Sunday Night NFL SNES Super Nintendo Game Cartridge Cleaned Tested and Guaranteed to Work! 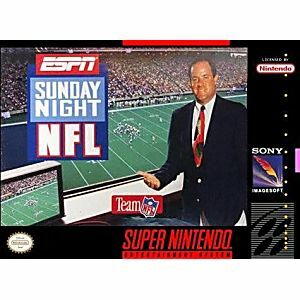 ESPN Sunday Night NFL for the SNES stands head and shoulder pads above the competition with incredible game play features and a true broadcast perspective. Hosted by ESPN's own Chris Berman, this game puts you in total control of the action with lots of incredible plays, complete rosters of teams and players, play-by-play commentary, plus pre-game, half-time and post-game shows, full season playing options and memory backup for saving your stats. Down on the field, you'll have unprecedented control over your own players. Battle your way through the playoffs and "you could go all the way" to the Super Bowl! This game is mediocre. It has no player names or even jersey numbers.